Thousands of home owners across Australia every year are having boundary fencing installed that is inadequate for their needs. Certain fencing systems, while stylish, have a significant design flaw that can leave home owners out of pocket in both money and time. After installation a common problem is found in the form of ugly, gaping spaces left between the ground and bottom edge of the fence. With the big players in the fencing manufacturing industry having created and ignored the problem for decades, Fence Finish Industries has stepped up to the challenge with its unique product to offer an elegant customer-friendly solution, Fence Finish Trim Panels. Fence gaps create many problems for home owners, allowing pets a way to escape yards, leaving brick paving and landscaping materials to wash out and providing a way for weeds, pests and rubbish to enter the property, among many more issues. Fence Finish Trim Panels can solve all these problems and more. Rectifying landscaping problems that caused the fence gaps is often a costly and time consuming exercise. With no adequate products available until now, fixing the problem with unsuitable materials gave results that could be unattractive, problematic and expensive. Fence Finish Trim Panels are a simple, elegant and cost-effective DIY solution to finish the home owner’s fence, saving them time and money in the process. The Trim Panels have been designed to be easily retro-fitted to the bottom of the fence and extend down to ground level, or below as required, to effectively seal off the gaps. With clean lines and being available in all available Colorbond colours, Fence Finish Trim Panels are the perfect solution. Fence Finish Trim Panels was born out of necessity, designed by Frisina shortly after moving into his new house three years ago. “After we built our house, it become apparent that our fences weren’t doing the job they were supposed to, we had a neighbour’s dog digging under the fence on one side and with bush to the back of our block, we had a snake pay us an unwelcome visit. I couldn’t leave my family at risk like that,” he says. After researching solutions Frisina was astounded that nothing was available that was easy and cost effective to finish his fence with. Wielstra says, “Previously most ways to close off the gaps under fences required the fence to be pulled down and significant work was required to fit existing systems or materials such as timber or bricks. Often other methods are also ugly and problematic. 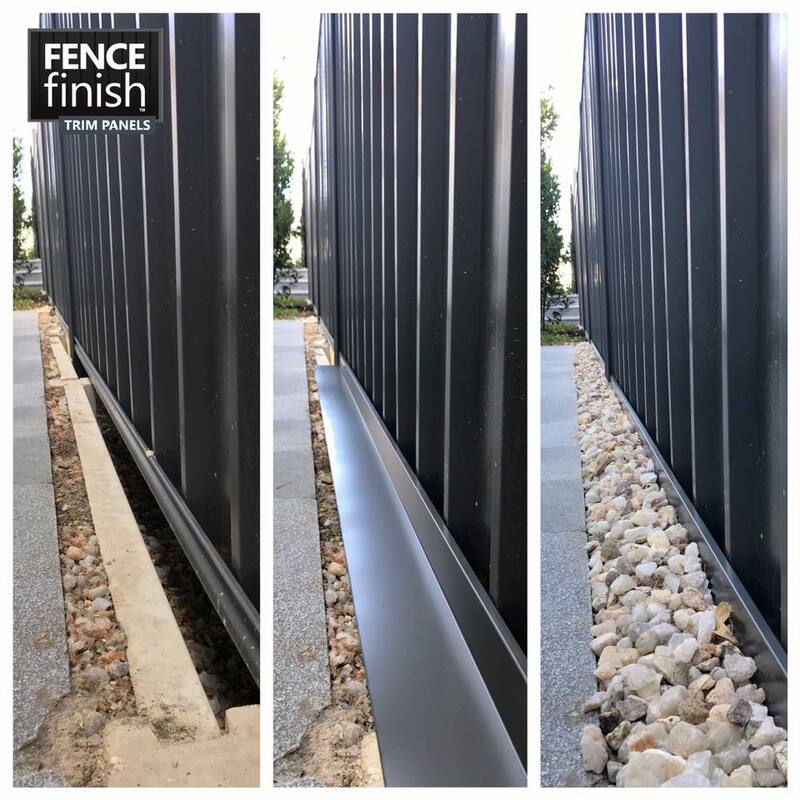 Fence Finish Industries is a small business committed to providing effective and affordable solutions to household landscaping issues, located in Perth, WA. Images courtesy of Fence Finish Industries.